The second leg of our French adventure was spent in Provence and the south of France. We took the train to Avignon (I left my new Gucci bag on the train and it took a trip all alone down to Marseille... thanks to Tom for saving the day) and rented a car before heading to a gorgeous house just outside Oppede in the Luberon. We found the most gorgeous home on Homeaway with a pool and plenty of space to accommodate an entire family. The restaurants in Provence were just amazing and traveling there in September meant the weather was fabulous with absolutely no crowds to fight. After Provence we headed to Cassis which happened to be my favorite stop on the trip. The MOST charming seaside town... with amazing food and scenery (shopping wasn't too shabby either). 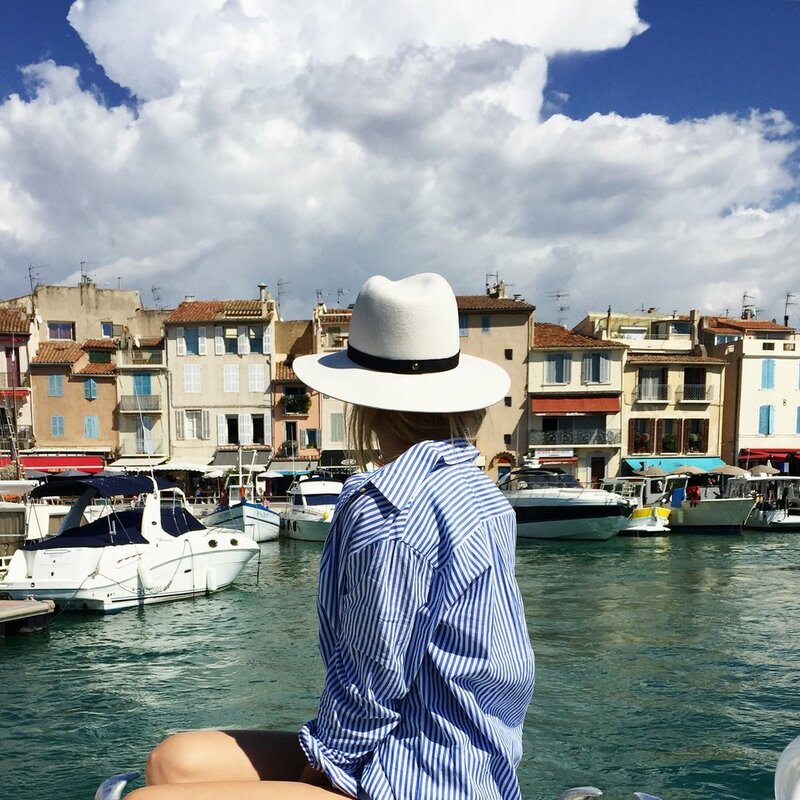 We took a boat around the Calanques and wandered around town eating and drinking until our hearts content before heading to Cannes for the night. We stayed at Le Grand Hotel Cannes and I have to say the location was perfect and the decor were so retro I loved it (would definitely stay again and again). Even though it was September it was still plenty warm to swim at the beach and enjoy the sunshine. Our final stop on the Côte d'Azur tour was Juan Les Pins with a stay at the famous Belles Rives hotel where F. Scott Fitzgerald lived with his wife Zelda. This was south of France glamour and luxury at its finest... absolutely gorgeous. Our days were spent exploring the pastel lined streets of Antibes and a heart stopping Ferris wheel ride (open air and quite terrifying with a 2 year old!) with gorgeous views is not to be missed either. We flew out of Nice with our hearts and stomachs full... and my wallet empty. Until next time France... Au Revoir. Wearing - KES (black frayed edge dress), scotch and soda (striped shirt), nomadic state of mind (rope sandals) Dear Society (off shoulder black dress, striped romper, straw clutch and golden dress) Doen dress (flower dress), APC denim skirt, J Crew swimwear, Tony Bianco mules, Janessa Leone hat.